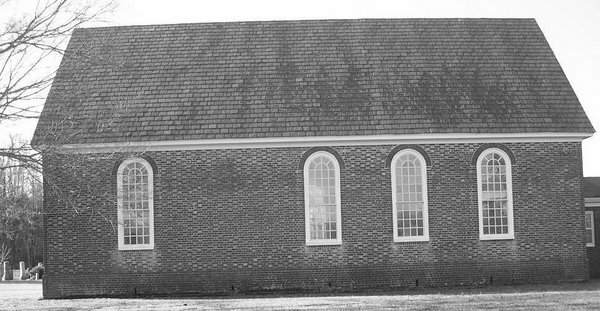 39 27' x 77 24': This church is located just off Route 95 and US Route 1 in Stafford Virginia. It is one of the easiest churches to find as the interstate exit, accessible from north or south, is labelled Aquia Harbor. The church is immediately north-east of the first light off the exit from 95. This is truly a splendid building. According to Rawlings (184ff), the brickwork dates from 1751 to 1757 and was destroyed by Union soldiers during the Civil War. The walls as well as the interior have been rebuilt to the pre-Revolutionary War state sometime around 1915-16. Large patches of the walls are obviously rebuilt, in some cases carelessly even to my non-architect's eye. Apparently there was a coat of yellow paint on the building as recently as 1933. Aquia is a true cruciform church with the walls 64' both east-west and north-south. Each arm is approximately 16' 2 1/2" long with a width of 32' 4". The walls are 24 1.2 " thick. Unlike Abingdon or Lancaster Churches, while in the interior, one can clearly see the cruciform structure, probably due to its Greek Cross construction. 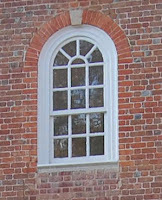 Like few colonial edifices, it has two levels of windows with the lower ones being rectangular with a keystone and angled soldiers and the upper being of typical compass construction. The front, west facade is two stories with a tower with a complicated cornice (See Rawlings 190). It is surrounded by an attractive churchyard with many curious graves of colonial and modern origin. In a later posting, I will describe the interior and many lurid stories surrounding the church. This is a must visit.